Sustainable architecture is an exciting and important field, with many people reviving traditional methods of building and others creating innovations to established practices. Kelly Hart, webmaster of the popular website www.greenhomebuilding.com, posts text and photos featuring what he discovers from around the world. Kelly Hart has been involved with green building concepts for much of his life. He has also worked in various fields of communication media, including still photography, cinematography, animation, video production and now website development. Kelly has lived in an earthbag/papercrete home that he built (but is now mostly living in Mexico) and consults about sustainable building design. Small Cob Buildings without Permits! 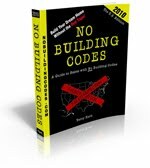 No Building Codes: A Guide to States with No Building Codes is an e-book by Terry Herb, 2010. Owner-builders across the United States are frustrated with the vast array of building codes adopted by so many states. Thankfully, there are still states left where you can build the kind of home you want without dealing with inspections and fees. You just have to do it in the right location--where building codes don't exist. Why pay thousands of dollars to architects for engineered plans because the building code officials tell you they need them; but you don't need them? There is a simple solution for the pioneers and out-of-the-box thinkers of today who want to swing a hammer without the hot breath of a code inspector on their necks. This downloadable e-book contains: An outline map of each of the 50 states with counties outlined as well; current code information for every state; for states with no building code, insightful commentary and information is provided to steer you in the right direction to determine if a state is right for you; researched and validated information; web links to help you learn more about the states that may interest you. The comment "but you don't need them" refers to the engineered plans. Not all owner/builders need detailed plans to build a safe house. The safety of any building project is always a concern and needs to be addressed regardless of whether codes are enforced or not. Anyone who buys a house anywhere, whether building codes are applied or not, should have it inspected beforehand. Can you tell me which counties have no property taxes? If I can find an overlap between the two, I'll be moving there! You'll have to check with the specific counties you might be interested in to find out about property taxes. That information is not a part of this book. Great find! It definitely gets frustrating when you're planning a dream house and then realize parts of your plan are impossible according to codes in your state. It is a wonderful thing to build a home free and clear all the while including our own personal integrity into the structure for it fosters true responsibility. Thanks for offering this book.